Here is our 13th installment, going up on Friday the 13th. Ooh, it's spoooooooky. 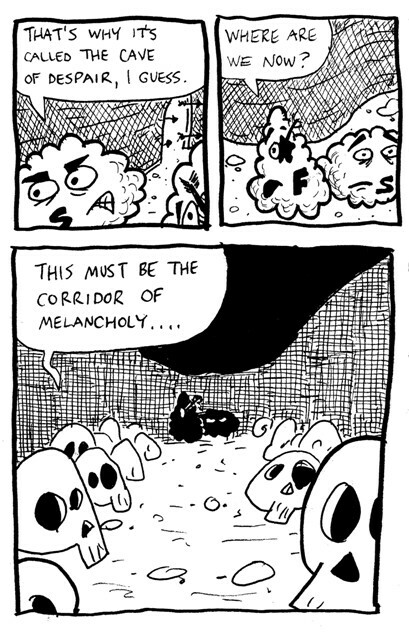 Dare you enter the Corridor of Melancholy? When D.F. French started drawing this page, he forgot that Fuzzball had an arrow in his eye, and had to go back and add it in. That would also explain why Fuzzball is so nonchalant about the whole thing--the dialogue was written without the eye injury in mind. I had intended to play up his anguish more, and make it more of a plot point, but things slip through the cracks when you're making fast 'n' sloppy collaborative comics. I like how the arrows are continuing to fly through the doorway back behind Fuzz and Scuzz. That's attention to detail!